Space, as it's been famously said, is the final frontier. A child's dream of space flight starts young, how many times have we as kids and adults looked at the stars and the vast space around them with a sense of awe and wonder. 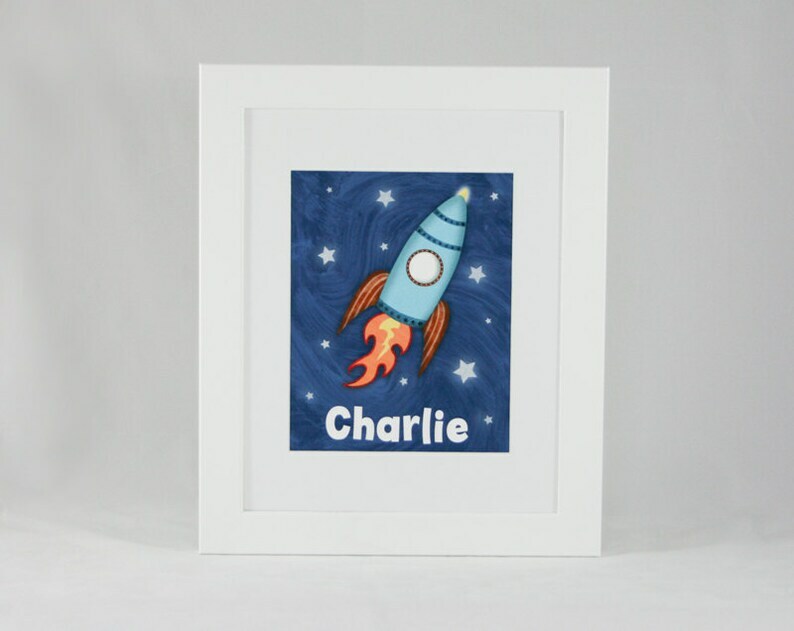 This personalized outer space rocket ship is an adorable piece of space themed wall art perfect for a nursery, playroom, or child's room! Inspire your budding astronaut or space scientist! This space themed wall art makes a great baby shower gift! My personalized rocket ship is hand drawn before being scanned and colored digitally. I then print each personalized rocket with a professional printer using Ultrachrome archival inks and Epson Ultra Premium Matte Paper. Each personalized print will be personally signed by me, the artist. Artwork measures 8" x 10". Print only, frame NOT included. Please note that colors can sometimes be different depending upon your monitor and color settings. Don't forget to include the child's name.